In this tutorial you’ll be learning how to build a simple rating system with jQuery Mobile and Mobiscroll Rating & Grading Scroller. Get the source file from here. 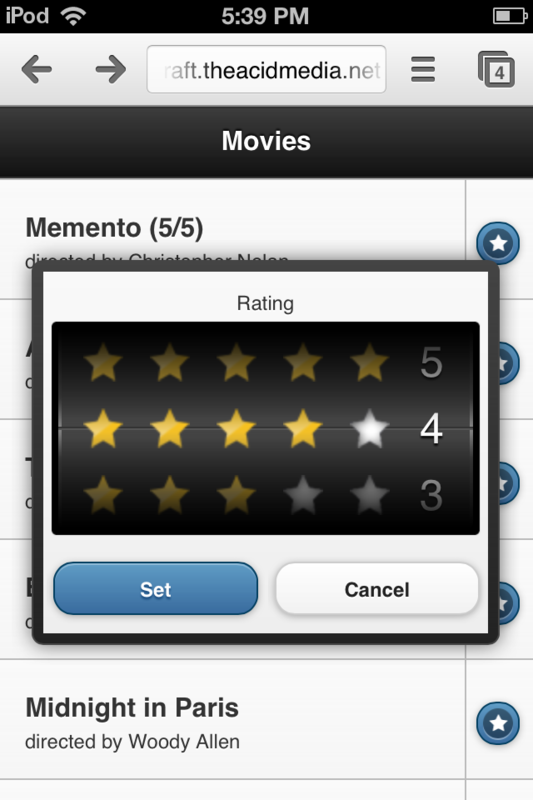 We’re going to create a simple jQuery Mobile page with six movies which you’ll be able to rate and then review your rating in the list. First things first… Include the libraries you need. We’ll be using a jQuery Mobile split button list. The button on the right will have a star icon, and it will bring up the rating scroller. The left container will hold the movie title, director and the received rating. 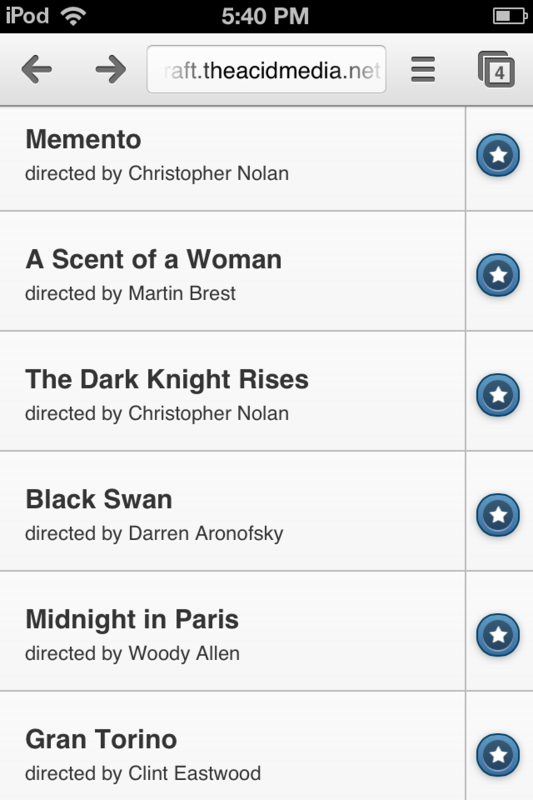 Clicking it will take you to the imdb movie page. The listview consists of an ul and several li elements. Each li element is divided into two anchors. As you can see the first a element links to iMDB and the second doesn’t link anywhere. We are going to capture the click event of the “star” button, and display the rating control. For more details on jQuery Mobile data attributes go to the jQM data-attributes documentation. Mobiscroll transforms selects or inputs into scrollers. It preserves the HTML markup, and populates the input or select with the chosen value. In our example we’re working with six inputs. Since we don’t need to display them, they can remain hidden. The selected ratings will be reflected in the list. Now let’s see what’s up with those inputs. Each hidden inut has a unique ID which consists of m and an index (m0,m2…,m5). You notice an mID attribute as well, which is the index itself. We’re going use that index to find the right container for displaying the selected values. Mobiscroll needs to be initialized with certain parameters in order to do the job. We’re going to create a data object and are going to reuse it for initializing every input in a for loop. onSelect – in order to display the selected rating on the UI we’re going to write a custom handler for the scrollers. We’re going to use the ‘mID’ property of the hidden inputs for finding the right span element and we’ll set its HTML content to reflect the rating. We need to handle the click events of our star buttons. We are doing that in the jQuery click event. We’re using the mID attribute of the element in order to find the right input so we can call the mobiscroll show function. Calling it will display the modal scroller, and load the value from the input. The first time it pops up it will display the default value, which is the first item from the list. Mobiscroll stores the selected value in the HTML element it is tied to. If it’s an input, it will store the selected value in the input itself. If it’s a select it will set the selected value. The intent of this tutorial is to demonstrate how fast and easily you can build a fully functional rating system with jQuery Mobile and Mobiscroll Grading & Rating Preset. It can be refined in several ways, and we’ve only addressed the client-side aspect of things. So let us know what you think in the comment section below.